As the title suggests, my citrus leaves are turning white on my calamandarin plant. It's a nice little plant, about 1 year old and a foot tall. I have it in a fishtank on the back porch with some plastic wrap on the side to keep the moisture in. The thing has been growing great until about 2 weeks ago when the leaves all wilted. Now they have for the most part unwilted themselves, but the leaves are turning all white (from the top of the plant down towards the bottom) and falling off one by one. It looks like it might not be happening to the bottom half of the plant. It may be a nitrogen deficiency. In other words, the plant may be starving. This may be simply because it hasn't been fed or possibly for other reasons, like waterlogging. Does the fishtank have drainage? Before you go feeding it , check the drainage is OK.
Is there anything you have done to the plant over the last few weeks, Including feeding? I checked a bit further Jim and it may also be an iron deficiency. This will be most likely in soils which have a Ph which is too alkaline thus locking up the available iron. A Ph test on the soil should clear this up. The Ph should be slightly acid. I am too concerned about the drainage in the fishtank, and if it's lacking, the plastic wrap is hindering even more. 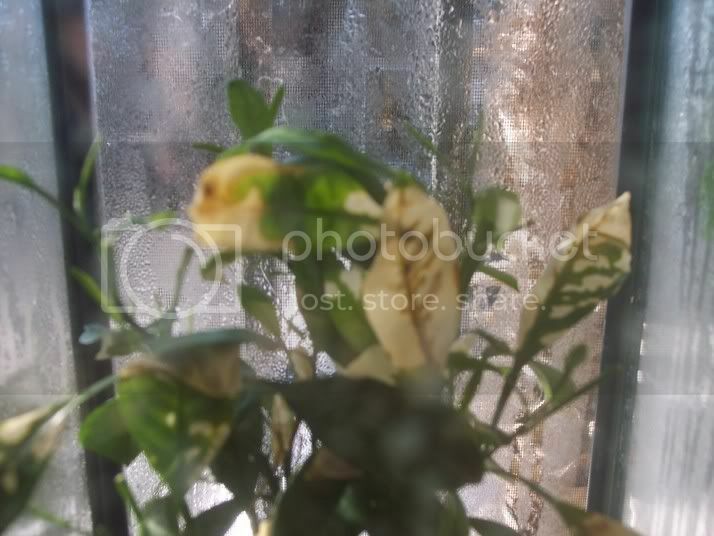 Does the calamondin dry out between waterings? Is it planted in fast draining soil? Do you fertilizer? And if so, which kind? There is no drainage from the tank, but there is good drainage in the pot. I probably only put water in the tank once every few months as the tank always seems saturated. I put miracle grow potting soil in when I initially potted it. I have not given it any nutrients since. The only other thing was that I took it out of the tank for a day a few weeks ago. Within two hours of taking it out of the tank, all the leaves curled up. I put it back in the tank, and the curling seems to have reversed itself somewhat, but the whitening of the leaves continues (much slower now than when it first happened). I'll try and take a picture tonight. As of now, it seems like I need to fertilize it? Jim, are you saying that the pot is sitting in water inside the tank? A foto would be great. It sounds like you may be drowning the plant so a foto would clarify this . Yes, I also get the impression that the pot is sitting in water, huge no no. It very important that it can dry out between waterings. If it's sitting in the water, it's feet are always wet. As for the curling of the leaves, it's normal. You took it from what seems like a very humid environment, and put it in much dryer conditions. I noticed the same thing on mine last year, after the huge heat wave we had, the humidity dropped, and all the leaves curled. I had to mist them back into shape. I don't think the leaves curling has anything to do with the whitening of your leaves. What is in your tank besides the plant? You said the tank always looks "saturated" which I find an odd term for a tank......is it a terrarium? I suggest 3-1-2 fertilizer if you can find it. I ended up settling for 3-1-1. Azalea food is good to. Make sure it's got all the essential micronutrients as well (Fe, Cu, Mn, Zn, Boron etc....). You said you used miracle grow potting mix when you initially potted it...how long ago was this? As you can see, there is just a tiny bit of water at the base of the tank. There is no standing water in the pot though. 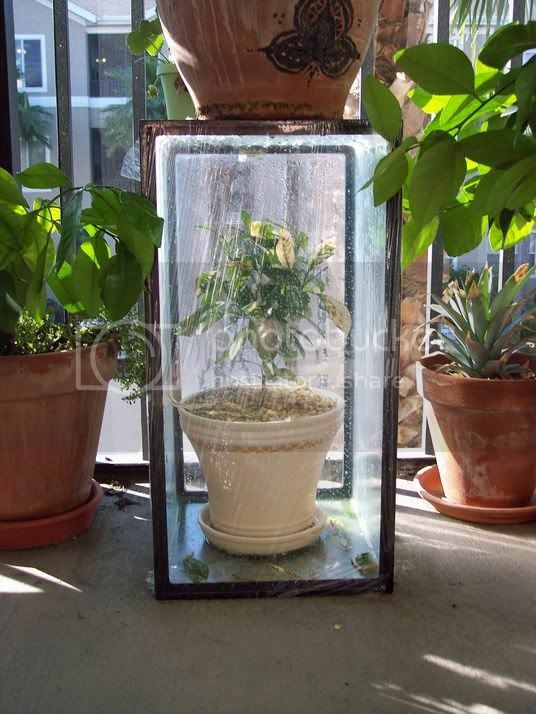 I figured this would have the same effect as placing some bowls of water around a plant, and the contained humidity would help keep the soil regular. Would this be considered sitting in water (as Longy and Eco pointed suggested)? This poor guy grew great in this environment from a seed a little over a year ago and only now started to look like poorly. I hope the images help! Thanks again so much for all of your help. Wow Jim, that's pretty weird.I don't think the drainage is a problem, though i think it may be too humid for a citrus plant. Question is though, is that why the leaves are going white!!! Somehow i doubt it. Seems excessive humidity would more likely result in fungal problems, though the lack of air movement may be a factor. So i'm going back to your fertiliser regime. Specifically re iron deficiency. How much fert does it get, how often and is it liquid or granulated. Organic or chemical? In the meantime i'll do some research. "Iron. The most common symptom for iron deficiency starts out as an interveinal chlorosis of the youngest leaves, evolves into an overall chlorosis, and ends as a totally bleached leaf. The bleached areas often develop necrotic spots. Up until the time the leaves become almost completely white they will recover upon application of iron. In the recovery phase the veins are the first to recover as indicated by their bright green color. This distinct venial re-greening observed during iron recovery is probably the most recognizable symptom in all of classical plant nutrition. Because iron has a low mobility, iron deficiency symptoms appear first on the youngest leaves. Iron deficiency is strongly associated with calcareous soils and anaerobic conditions, and it is often induced by an excess of heavy metals. " This is an excerpt from a tomato website i use, which details the visual effects of iron deficiency on leaves. Note the bit about anaerobic conditions. This basically means a lack of fresh air. Now that container is pretty much sealed so i'm wondering if this is an indication of what may be going on. So, i suggest you take the plant out of its tank and allow it to breathe a bit. Also, give it a feed with some liquid seaweed or fish based fertiliser. Then wait and see. It would probably be worth giving the plant soil a good flush too, just to wash out any staleness of air in the root system before you feed it. Please keep me posted . i'm enthralled. You gave me some great advice. 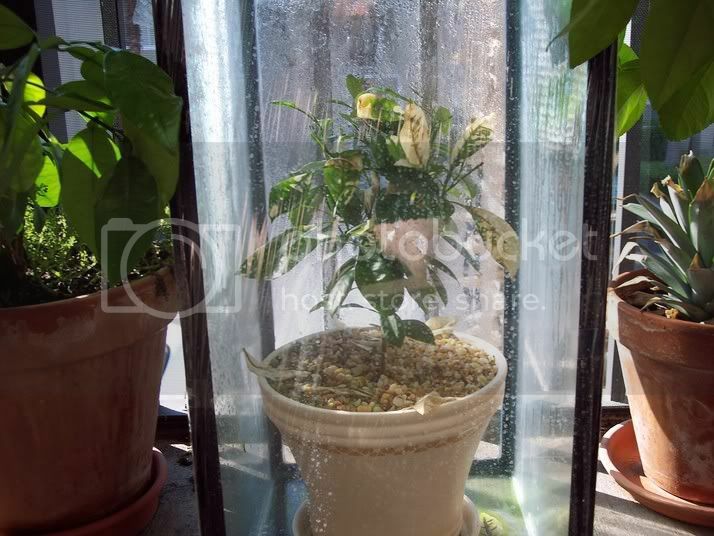 I will give the plant some fresh air (and also poke some holes in the plastic wrap) for starters. I will also go looking for some fish-based fertilizer later today. To answer the fertilizer question specifically, I have some granulated 17-17-17. I put maybe a teaspoon on twice a year. I get the impression that anymore would be too much for a potted plant. I'll make sure to follow up on this. Hey Jim, no probs. Your fert sounds OK. Maybe not perfect but sufficient. The reason i suggest the seaweed fert is because it is more of a micro-nutrient supply than a fertiliser as such. Also it is very gentle and unlikely to cause further complications if diluted properly. Just have a read on the label and see if it includes iron. I can't remember if it does or not. Would you consider leaving the plant out of the tank altogether? At least for the warm season, then maybe putting it back in winter? I definitely could. I live in Tampa, FL, so there is not much of a Winter really. It's always been easier for me having it in the tank because I don't have to worry about when to water it or how much is too much, etc. I reckon that'd be the way to go. Even consider putting it outside in more sun. (gradually, after hardening it off) You may need to water a little more regularly. Hey Jim, I suggest you get yourself some citrus ferts, especially if you are in Fla, easy to comeby I hear. What you are using is all purpose ferts, like 20-20-20. You want more N in prportion to the others. My citrus Guru suggests like I mentioned above, three parts Nitrogen, one part phosphorus and 2 parts Potasium. You should see his greenhouse. I will never stray from what he says lol!! Most ferts lack one important trace element for citrus, magnesium. You may want to try a 1/2 teaspoon of espon salt every second time you fertilize along with the seaweed fert as Long suggests. One thing that bothers me though....do you know where your seeds came from? There is such thing as variegated citrus' and the whitening on yours looks similar to what I have seen in pics. I know someone who just recently showed pics of theirs and it's almost all white!! Everyone is in awe that it actually can photosynthesize anything. I suggest this cause maybe it's reached maturity enough to show the variegation? I have an african violet that didn't show it's white edging in the leaves until after about two years of growth. You said the leaf drop slowed or stopped after you returned it to it's habitual environment, maybe the drop was due to the change and has nothing to do with the whitening? Just throwing out some possibilities here. Hey, If it does turn out to be variegated, lucky you! Just checked with my "Guru". He looked at the pic and he says it looks like bleach marks from the sun due to a sudden climate exposure (Maybe when you removed it from the aquarium). If so, new leaves emmerging after the initial shock should be back to green. Also they said to check your pH immediately, I think it's because of what Long said about the Fe uptake when the pH is off. Also, they strongly suggest you look at the root ball for anything unusual. All in all, he says it should recover ok without any kore turmoil. Eco! That makes perfect sense! The leaves did start to change color right after I took it out for 12 hours of maintenance. I am working on slowly adapting it to a different humidity and environment. To respond to your other message, Eco, the seeds came from my other plant which is growing on the back porch. I had purchased that original plant from a local home & garden store. Longy, I would love to get this plant more sun. As soon as I get out of the apt and into a house, it will be the first thing I do.